Home > CULTURE > TRADITIONAL > SUMO Fighter! The King of the Ring! SUMO Fighter! The King of the Ring! 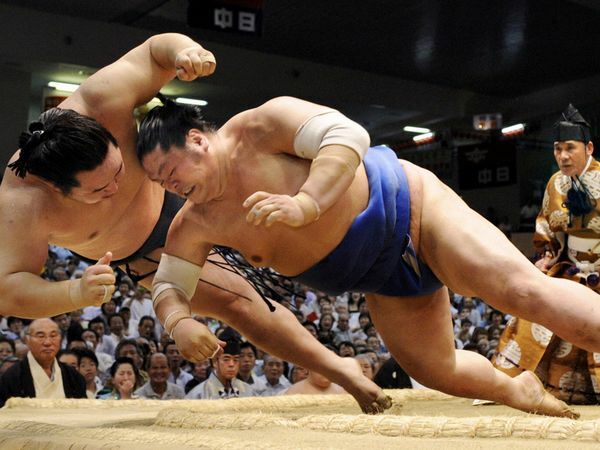 Sumo is a Japanese style of a competitive full contact wrestling sport. In general, it is organized on a circular ring, which is known as “Dohyo” in Japanese.And inside the ring, there are two wrestlers (“Rikishi” in Japanese) who attempt to force each other to lose balance. The one who would make the other wrestler out of the circular ring is the Winner. The ring is 4.55 meters in diameter and 16.26 square meters in area. At the center, there are two white lines, which are called “Shikiri-sen”, and behind those lines are the positions for the wrestlers when the bout begins. 1. Forcing his opponent to step out of the ring. 2. Forcing his opponent to touch the ground with any part of his bodies other than the bottom of his feet. HOW TO GET THAT BIG? Sumo wrestlers special food is “Chanko”. It is is like a daily alimentation of stews (Chinese food), sashimi, and deep-fried food. They also take a nap repeatedly to get their body bigger and bigger. It is a place where the “Rikishi” (wrestlers) live and train all together.There, the rules for Sumo are so strict, such as sleeping time, eating, training time, and etc. They begin at 5.00am in the morning. First of all, the unranked wrestlers begin their training. They can practice at each stable. The most important thing from Sumo wrestlers is the lower body strength. They must improve it so that they can’t fall in the ground. Not only that, but there is also another exercise, which is called “Teppo”. This exercise teaches the wrestlers the basics of moving their feet and hands as they try to topple an opponent. You can find this Sumo stable at Tokyo (Ryogoku district) and you may have the chance to meet some Sumo fighters. There are around forty stables there. One of the most famous Sumo stables is Ryōgoku Kokugikan. Or you can wait for the season of Sumo match in your Area in Japan. Shine Shine Monk! Teru Teru Bozu!